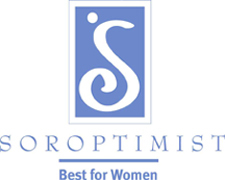 Soroptimist is an international organization for business and professional women who work to improve the lives of women and girls, in local communities and throughout the world. The name, Soroptimist, means “best for women,” and that’s what the organization strives to achieve. Soroptimist are women at their best, working to help other women to be their best. As part of Soroptimist International, we join almost 95,000 members in about 120 countries to have a global voice for women's rights, health, education and other issues working through Awareness, Advocacy and Action. "A Global Voice...A Global Vision." See the complete organization structure. The first Soroptimist club was formed in 1921 by a group of 89 women in Oakland, Alameda County, California. Violet Richardson was the Founder Charter President, and by the end of the first year, other women established additional clubs in San Francisco, Los Angeles and Washington, D.C.
Soroptimist International is truly an international organization today, with clubs established in 125 countries and territories, and a membership of over 95,000 Soroptimists.